New struts have no trouble supporting the glass hatch. I dealt first with the failing struts. The struts that supported the hood allowed the it to fall in a slow, graceful manner. It wasn’t an ideal situation, but the slow march of the hood to its natural resting position would not cause a concussion. As a temporary fix, a broom handle provided adequate support for the hood, but installing the new struts proved to be quite a luxury. The rear hatch was a different story. 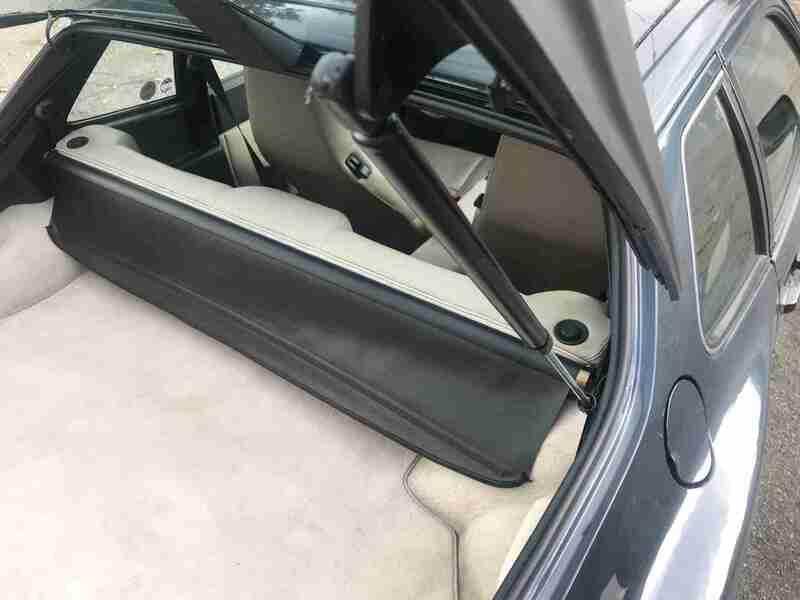 The big piece of glass in the back of a 944 is quite heavy. With depleted struts, the hatch falls like a guillotine. Had old 944s been available to the French in the late 18th century, I have little doubt they would have employed them in the removal of heads during the revolution. There is a hatch release inside the car, which was rendered useless by the failed struts. New struts from Pelican Parts made it so the hatch would actually pop up when released. 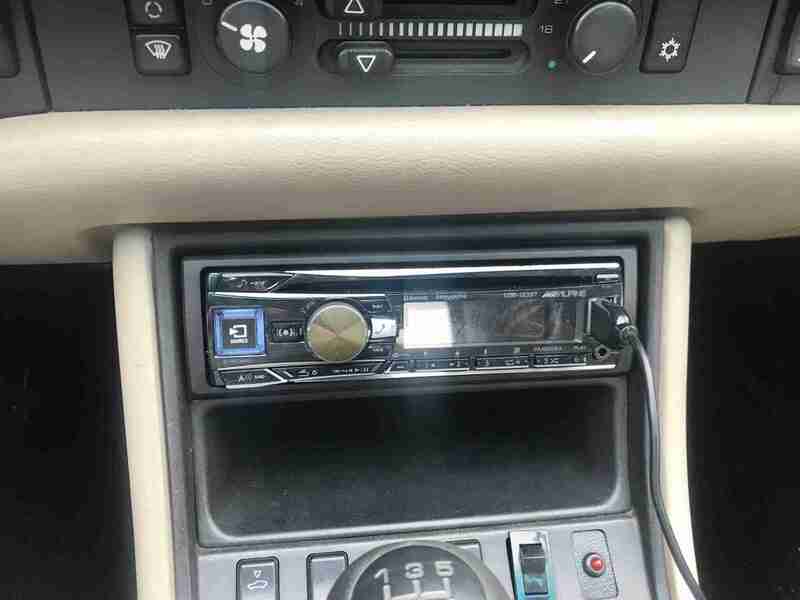 Alpine receiver has auxiliary, USB and Bluetooth input. The aftermarket receiver that came in the Porsche had an aftermarket cd player and no auxiliary input. I haven’t listened to compact discs since about 1973 (my memory about that may be a little off) and iTunes has spoiled me for FM radio, so this unit had to go. In its place, I ordered an Alpine CDE-163BT receiver from Crutchfield. Don’t go looking for this particular unit as it has been discontinued. This gem features USB input, Bluetooth for hands-free calling and streaming audio and a remote control that I will never use and have probably already lost. The sound quality is sufficient. Ideally I would add an amp, subwoofer and new speakers to the system, but it’s quite functional now with the new receiver and there is little room in the car for additional audio equipment. I purchased better center caps separately. My wife approved of my choice of a 944. She would have no qualms about disapproving of my choice of a car, but was pleased to have this in our driveway. Her one protest was that the wheels were ugly. The original phone-dial 15 inch wheels weren’t to my liking either, I had to admit. Along with their pedestrian looks, they had the added disadvantage of limited tire choice in the 15 inch range. 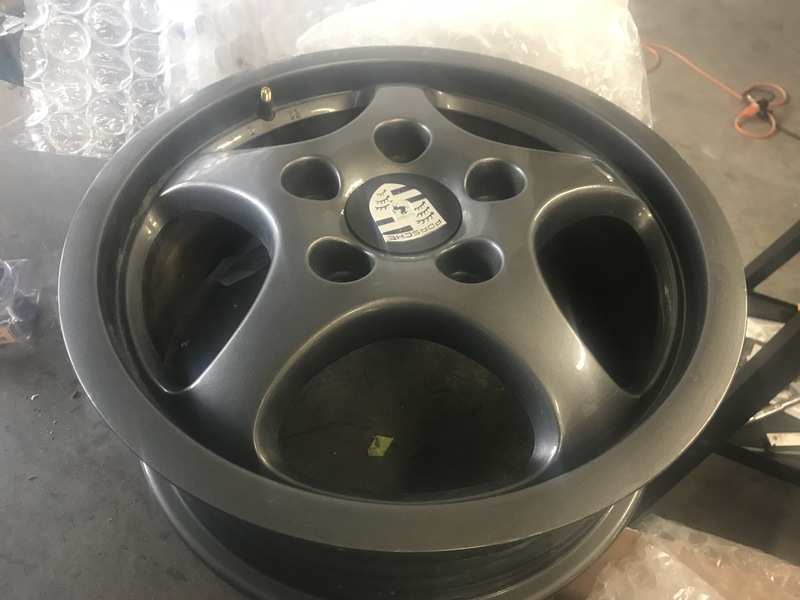 eBay presented a solution with 16 inch Cup 2 5-spoke wheels, from a Porsche 964. They were painted grey, but one of them had curb rash, so I figured if I didn’t like the grey I could have them painted silver. I also purchased some used chrome wheel centers on eBay. After test mounting the wheels, I decided I liked the grey. The curbed wheel was repaired and the wheel and the new centers were painted a matching grey. There are some good tire choices available in the size I need for the 944 (205/55R16), including Michelin Pilot Sports and BG Goodrich G-Force Comp-2. I decided to go with Continental ExtremeContact Sport summer tires (who names these things?) These tires are purportedly good in the rain, and it does rain in Seattle. They’ve performed quite well in the wet and the dry and I’m glad I made the decision to go with 16 inch wheels instead of 17 inch, as I believe the ride would be too harsh with the shorter sidewall. Brand new Momo Monte Carlo ready for install. 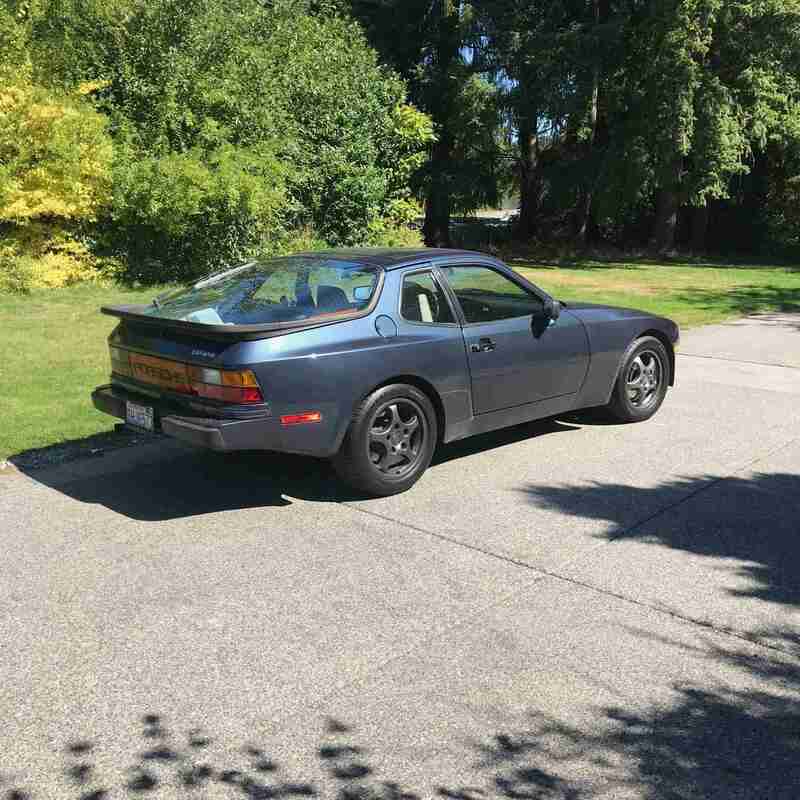 My 944 came with the factory with no good wheels. I’ve never been a big fan of Porsche’s steering wheels, with the horizontal bar spanning the diameter of the wheel. It is functional but not esthetically pleasing. 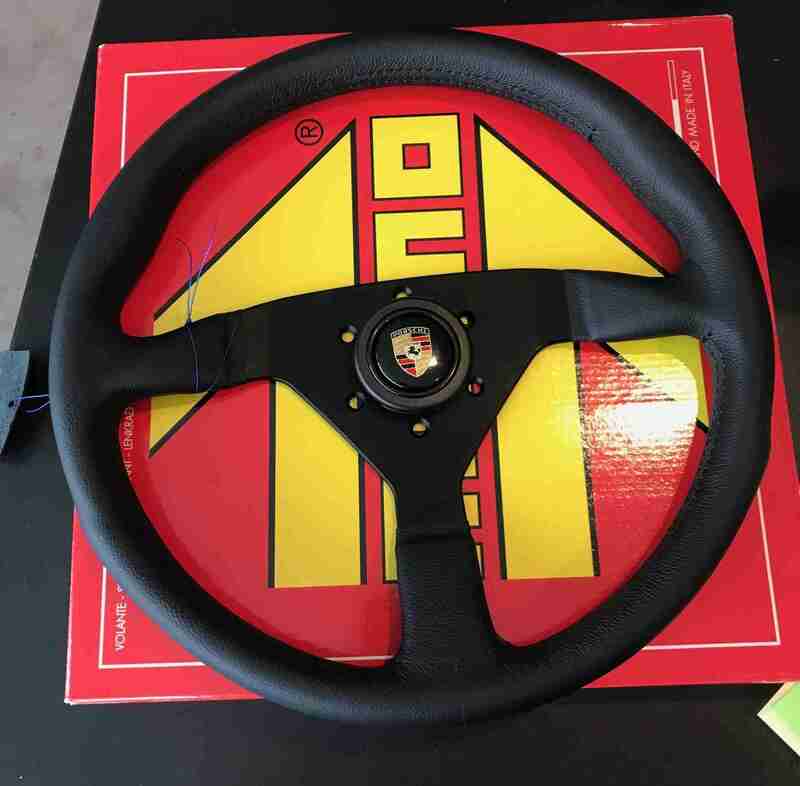 If you doubt my words of wisdom, ask yourself why Singer uses a Momo wheel in their 911 creations. A Momo Monte Carlo steering wheel was one of the items on my birthday list and when the birthday-present slot machine started spinning, it came up all Momos. The Monte Carlo is similar to the popular Momo Prototipo, but is a little less common. I already had a Prototipo in the BMW 2002 and didn’t want to repeat the wheel, as much as I like it. Along with the wheel came the necessary wheel adapter and a Porsche horn button center. 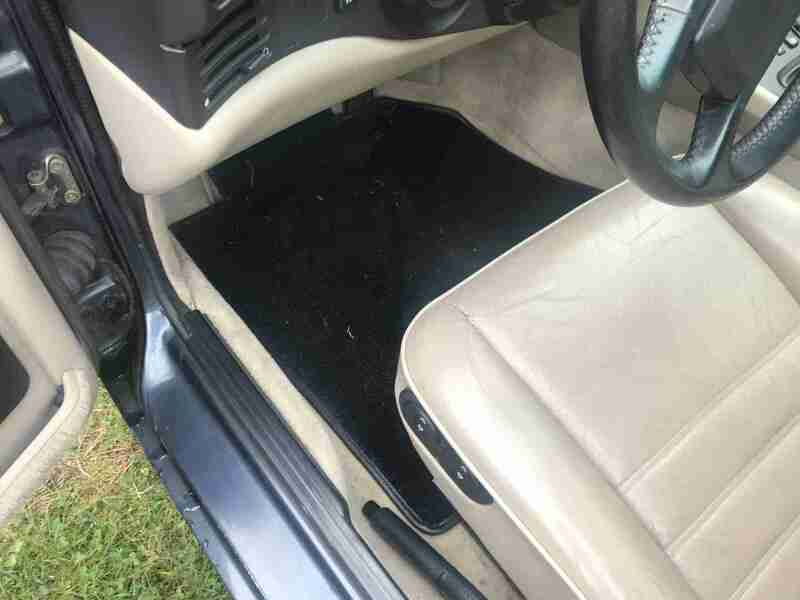 This probably sounds like a stupid little item to address, but my 944 had blue floor mats. Yes, the car is blue on the outside, but the interior is tan and black and my wife, whose interior design eye is much better than mine, suggested they be black. By “suggested”, I mean she mocked me for having blue floor mats. I ordered Lloyd’s custom 944 floor mats for the front and rear. They arrived, sat in the trunk of the LeMans for many months and were installed in the 944 with ease, fitting perfectly. What’s next? Nothing! Now it’s time to drive.